For a pair of hardy breeches that will fit well into any costume, you will need to turn to these Rustic Medieval Breeches. But have no fear, for once you have tried them, you will want to wear them every time, both for style and for reasons of pure comfort. These attractive trousers are breeches in name only, featuring classic pant construction that ends just beneath the knee, exposing the calf and the ankle. They are made entirely from 100% woven cotton and feature a looser fit around the legs to ensure the utmost comfort possible, while still featuring a classic and historical look that pairs well with dozens upon dozens of different costumes and styles. Even more appealing is that these breeches feature two side pockets, which makes carrying things like modern amenities easy. They are closed in the front by a series of wooden buttons. These breeches are also available in three different colors, black, dark brown, and natural, to ensure that a color is available that pairs perfectly with your style. 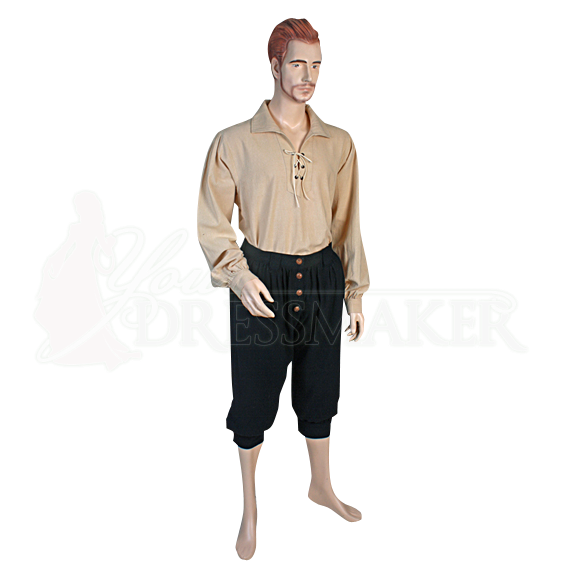 Versatile and comfortable, these Rustic Medieval Breeches will become a staple of your fantasy attire, if only because they are so easy to integrate into almost any look you can come up with! This item was a nice addition to my costume.